So in about 6 months my lovely husband is turning the big 3-0! That’s an awesome thing all together, but he’s got a grand plan and really wants to see it through. “They serve beer there,” he says with smile as if that’s all the explanation he needs. His love of a great ball room is clouding his judgement I think. But as this is a huge event in a person’s life, I really want to make sure that his birthday party is as close to his wishes as possible. The pizza should be easy enough – I can order in a bunch to be delivered, people can come and drink beers. We can have loud fun music – perhaps even great pop tunes from our childhood including Reece’s Pieces and anything else that people can come up with. I can put out colouring books and crayons, pop on video games on the tv in the basement and we can have a blast. The tricky part will be the ball room. Our house is really open concept so finding a way to have a ball room will be a little bit difficult. Also, how important will it be if the balls are all one size? 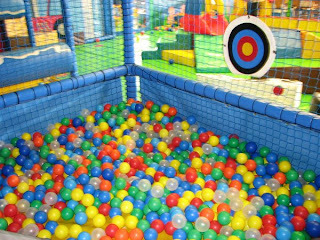 What if I called upon all my friends and family and got as many balls as possible to fill say a blow up swimming pool. We can then throw James in and he can play to his hearts content! Or perhaps we could try and blow up thousands of balloons and do something with that as a pseudo ball room. Only problem with a house party Chucky Cheese style would be the animatronics. I really don’t think I can arrange something like that. But I might be able to convince someone to dress up like a giant mouse. I can see the awesomeness now! I know that his dream is actually going to Chucky Cheese so I will look into this option as well. 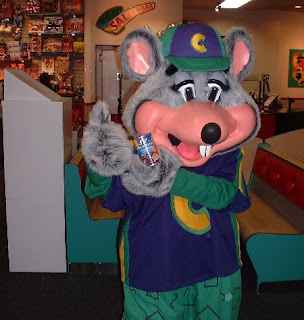 Chucky Cheese is located within somewhat stumbling distance from our house. I say somewhat – as in Februrary it might not be a good option – but say in July/August on a warm night for sure. So – the hours are good – Sunday through Thursday until 10pm and Friday and Saturday until 11. We could, by rights, go after the little munchkins are in bed. The party packages actually look like they include a bunch of things – but they keep mentioning children. James really wants an adults only party so I’m not sure that they would be the same prices. They have two packages – Star and Super Star. $16.99 to $22.99 per child – but that only covers two slices per child. I don’t think I’d be able to cover the complete cost of this for ALL our friends. Hmmm….. I think this allows some questions. Maybe we could coordinate people to come and then pizza to be delivered after all the games? Lots to think about – but either way, I’m going to try and make his birthday one to remember!